Japanese studio Moku Woodware created the Desktop Stool – a laptop stand that frees desk space allows you to have a better posture while working. 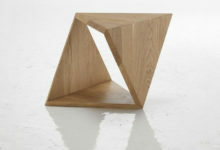 The Desktop Stool comes in two beautiful finishes, white basswood and brown walnut. Available for purchase here. 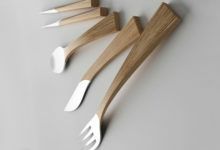 Fju is a really cool space-saving piece by Cologne based design studio Kaschkasch. Fold it down and it’s a small workspace. Fold it up and it transforms into a slim storage shelf. Clever!